There will be a water shortage in 2015 unless steps are undertaken to curb the use of water and prevent water wastage for the next 1-2 years. A media briefing at the Kouga municpality in Jeffreys bay this morning was told the Kouga region is facing a water shortage again and consumers have been urged to reduce water consumption by at least 10%. The media briefing aimed to raise awareness of this looming water shortage and the role each resident can play to help delay the introduction of water restrictions. 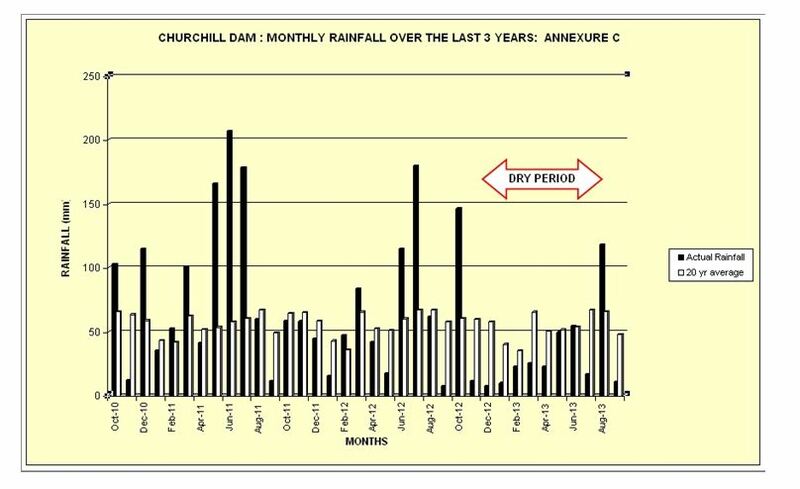 Q.Why are we in this situation again only two years after the last drought ended whilst the average dam levels are above 80%? The Department of Water Affairs carries out annual modelling of the water resources of the region. The model predicts that by 2015 NMBM and Kouga will be in a water shortage crisis and that we need to start curbing consumption immediately. 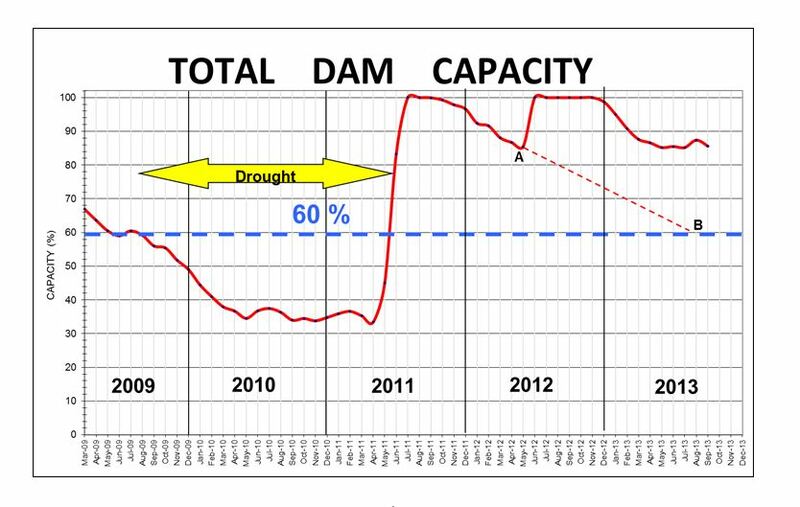 The table below shows the combined capacity of the storage dams (graphs courtesy of NMBM). The volume of water stored in our dams will be depleted within 18 months if the current consumption patterns persist and no significant inflow into the dams occur over this period. The table below compares the actual rainfall figures with the average rainfall figures over the past 20 years. Q. What is Kouga doing to address the looming water shortage? Kouga Municipality maintains close contact with the Department of Water Affairs (DWA) and will implement water-saving measures, including possible water restrictions, in line with their recommendations. Various projects have been identified by DWA to expand the water supply to the region. These include treating waste water, dune filtration systems, boreholes, sea water desalination and increasing the capacity of the Kouga Dam. Kouga Municipality is further focusing on water conservation. The municipality has embarked on an aggressive leak detection programme to reduce water losses. R1-million has already been secured from the Department of Water Affairs towards this programme. Studies have been conducted and plans drawn up to tap into more of Kouga’s ground water supply, however, the implementation of the plans will require exploratory drilling on private land and a significant capital layout. Consequently, the plans form part of the municipality’s long-term vision to increase its water supply and are not an immediate, short-term solution. When will water restrictions be introduced? Q. What can residents do to help address the looming water shortage? The municipality and the Department of Water calls on the citizens of Kouga, in the spirit of Ubuntu, to hold hands and ask that everyone conserves water and use it efficiently. Residents are encouraged to cut their water usage by at least 10% and to help spread the message. All articles edited or written, all photos taken plus all adverts designed by the Editor and printed in the St Francis Chronicle are protected by the law of Copyright ©. Reproduction or copying of any part of the contents of this newspaper and its concept and design can only be done with the Editor’s written permission.